This is the 2007 reprinted edition of the 1922 original. In many ways, this is a classic guide to drawing with pencil. This book is rather wordy. There are pages with just text and occasional pencil drawing examples. There aren't any step-by-step instructions although there are mention of techniques in the paragraphs. Highlight of the book would be the insightful discussion on pencil drawing and drawing fundamentals. However, you might find yourself reading the text and turning to a page to refer to the illustrated example mentioned. It's a book that warrants repeated readings. Since the original was published in 1922, many of the illustrated examples are from before that period of time. They still look great. Techniques are timeless anyway. 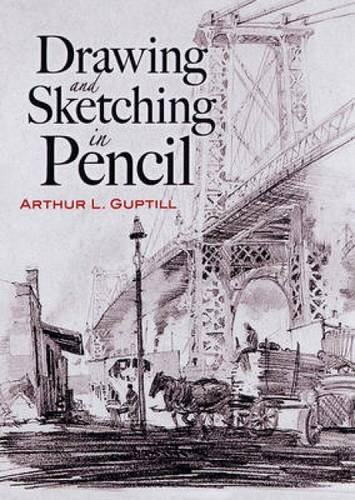 The author Arthur L. Guptill has another book called Rendering in Pen and Ink which I liked better. The reason is because the techniques are more properly demonstrated. Overall, it's an insightful book on pencil drawing. However I would actually recommend this a companion book to those step-by-step pencil drawing books where you can learn practical drawing skills very quickly. You can then refer back to this book for more thoughtful discussion on different subjects and art itself. Another book I recommend would be Pen and Pencil Drawing Techniques by Harry Borgman.